Amundsen-Scott South Pole Station, February 2008. 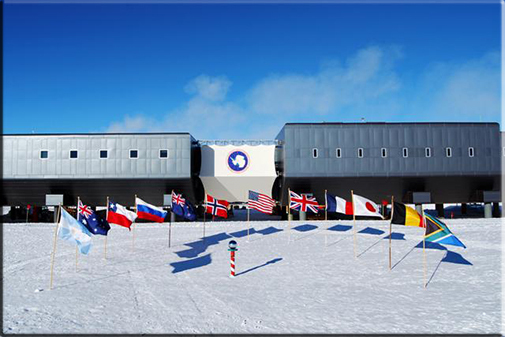 In the foreground is the ceremonial South Pole and the flags for the original 12 signatory nations to Antarctic Treaty. Visit the South Pole webcam. 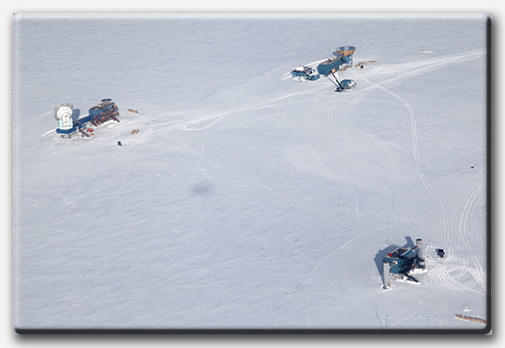 Read recent reports from South Pole Station, published in the Antarctic Sun. 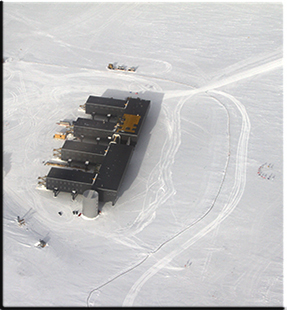 Recent NSF press releases about the South Pole and research. Americans have occupied the geographic South Pole continuously since November 1956. The station stands at an elevation of 2,835 meters (9,306 feet) on Antarctica's nearly featureless ice sheet, which is about 2,700 meters (9,000 feet) thick at that location. The station, which is 850 nautical miles south of McMurdo Station, is drifting with the ice sheet at about 10 meters (33 feet) each year. Recorded temperature has varied between -13.6° C and -82.8° C. Annual mean is -49° C; monthly means vary from -28° C in December to -60° C in July. Average wind is 10.7 knots (12.3 miles per hour); peak gust recorded was 48 knots (55 miles per hour) in August 1989. Snow accumulation is about 20 centimeters of snow (6-8 centimeters water equivalent) per year, with very low humidity. The station's name honors Roald Amundsen and Robert F. Scott, who attained the South Pole in 1911 and 1912. The first station, built to support researchers during the International Geophysical Year, was begun in November 1956 and completed in February 1957. As interest in polar research increased, it became evident that a new design and a larger station was necessary. In 1975 the central area of the station was rebuilt as a geodesic dome 50 meters wide and 16 meters high that, with 14- by 24-meter steel archways, covering modular buildings, fuel bladders, and equipment. Detached buildings housed instruments for monitoring the upper and lower atmosphere and for numerous and complex projects in astronomy and astrophysics. There is an emergency camp. The dome facility was designed to house 18 science and support personnel during the winter and 33 during the austral summer. However, over the years, the facility's infrastructure and technology have exceeded its design and operational life. To augment the existing facility, a number of science and berthing structures were added in the 1990s, particularly for astronomy and astrophysics. An aerial view, taken in 2011, of the elevated station and the ceremonial South Pole. In 1997, a redevelopment plan to upgrade the station began. The new station, which was dedicated in 2008, is one connected, elevated facility. To accommodate changes in population from winter to summer, certain areas can be closed. Remote science facilities are being developed with small one- to two-story elevated buildings and are located away from the main station to minimize interference between necessary operations and science. As part of the elevated station, the existing arches were re-used for fuel storage, cargo, and waste management. New arches accommodate the garage shops and power plant. The benefits of elevated structures include reduced snow drifting, increased building life, diminished environmental impact, enhanced safety, maximized solar energy use, and more cost-effective construction. Some 50 scientists and support personnel winter at the station, and up to 150 people work there during the summer. The station's winter personnel are isolated between mid-February and late October. The station has an Atmospheric Research Observatory, the Martin A. Pomerantz Observatory for astrophysics, and computer systems for research and communication including Internet access. It has collected the longest continuous set of meteorological data from Antarctica's vast interior ice plateau, and it is well located for studies of the cusp region of the magnetosphere. Astronomy and astrophysics have flourished in recent years, taking advantage of excellent optical properties of the atmosphere (resulting from its high elevation, low temperature, and low humidity) and, for neutrino detection, the extremely clear and homogeneous thick ice below. A small biomedical research facility is present. Other areas of interest include glaciology, geophysics and seismology, ocean and climate systems, astrophysics, astronomy, and biology.